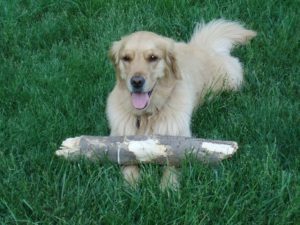 Today Basi is a loving, energetic and happy 4 year-old Golden Retriever. In October of 2014 her family found a lump on the middle of her back. Their local veterinarian did a biopsy and diagnosed Basi with a cancerous tumor called a chondrosarcoma. Treatment of choice is normally a combination of surgery and adjuvant radiation therapy. A CT scan was performed. Based on the size and location of the tumor it was determined that surgery would be very difficult, they may not be able to remove the entire tumor, and it might even damage her spinal cord. Basi’s family and veterinary team decided on stereotactic radiosurgery (SRS) based on its precision dosing, need for fewer treatments, less side effects and curative intent. In early November of 2014 Basi received SRS. One year later, she is back for a check up and doing wonderful. Her family tells us she loves ice cream, chasing tennis balls and brining home large logs to use as chew toys. Basi was treated at PetCure Oncology at Veterinary Imaging and Radiosurgery Center in Clifton, New Jersey.